The Avalon Project has joined the international social movement Extinction / Rebellion (XR), which has launched a global campaign of nonviolent pressure on the world’s governments for criminal inaction in the face of the foreseeable civilisational collapse that could cause climate change and the massive species extinction. 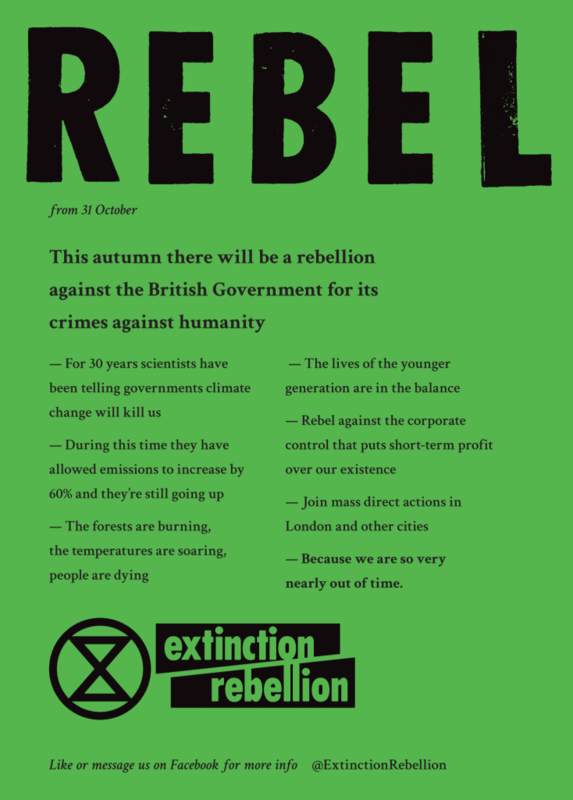 The Extinction / Rebellion movement had its origins in United Kingdom, through a call to action issued by about one hundred academics. It is a campaign of massive and peaceful civil disobedience, sustained over time, whose objective is to pressure the political class and activate society before the climate collapse and the ecological crisis. At the moment, work is being done to hold a global day of civil disobedience on 15th April, 2019 in the countries’ capitals. After the largest action of peaceful civil disobedience in recent decades in the United Kingdom, on 17th November 2018, XR has become a global movement of resistance and non-violent pressure on governments against climate change and the extinction of species, including ours. Members of the management of The Avalon Project are participating in the organisation of XR at the state level in Spanish state, as well as coordinating the actions of the movement in Granada. On the other hand, the participation of Avalon volunteers in XR in other cities of Spain is already expected. Keep in mind that our organisation has been just re-launched (28th November) after 5 years in stand-by, but soon we hope to have other volunteers collaborating with XR in other cities of Spain, such as Seville, or the world. If you want to read the International Statement of XR, or if you want more information or contact ways, click here.